Writing about design helps me become a better designer. Read some of the things I write about. Below is a small analysis of the card game, Spyfall, based on the framework provided by Stone Librande that focuses on Start, Goals, Obstacles, Decisions, Rules and Interactions as major components of a game. The analysis also explores a little bit of Mark Le Blanc’s 8 types of fun. 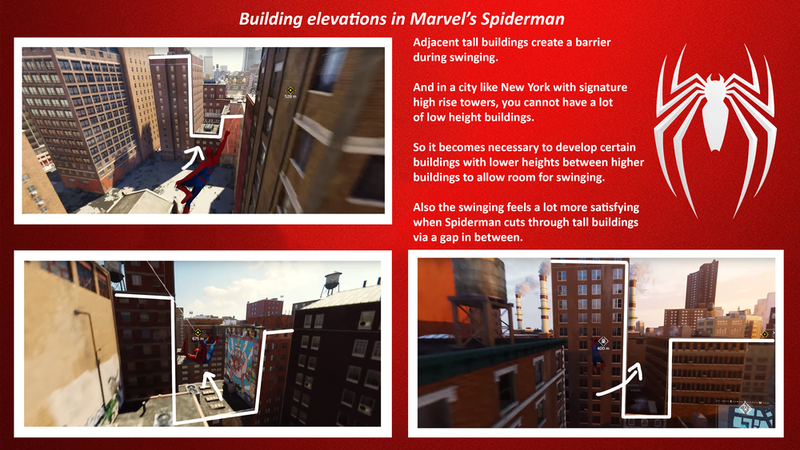 I’ll be regularly posting level design insights from Marvel’s Spiderman here. This blog outlines a framework taught by Stone Librande, Lead Designer at Riot Games, in his game design class at CMU, that allows for quick development of games and evaluation of their design. More specifically, by following the framework, you can start developing your game in less than 15 minutes and iterate on it quite a few times by the end of the hour. WHAT WAS WRONG WITH ASSASSIN’S CREED BLACK FLAG? The game touted as the one having the best gameplay in the Assassin’s Creed franchise had something wrong it. The story mainly never worked for most players and there were two major reasons behind that - player motivation and the protagonist’s relationship with his targets. Started replaying God of War during Christmas 2018 to better understand design techniques being used to carve the beautiful world. I’ll be regularly posting images with insights. How does Journey evoke strong emotions? Journey does an excellent job of evoking emotions within the player in a short period of time. Feelings that the designers wanted to evoke within the players — first, a great sense of awe; second, the feeling of being small compared to the vast world; third, the feeling of an unknown and mysterious world and fourth, a sense of companionship that is free from all biases. Everything related to companionship should be in the context of the game, and no real-world biases like gender should affect the players’ perception. When beginning to design a new game, it is always a dilemma for the designer to choose between the theme or the mechanic as starting points. I have recently come across a few situations where all the members on the team had highly differing opinions on where the design of the game should start from. I aim to establish a fairly rough pipeline on how to tackle this dilemma and will do so by talking about two cases here; one is a game jam and the other is a semester long academic project.